This program provides an X-Windows driver for the original Tabby graphics tablet. It runs as a stand-alone program and generates pointer and button events using the Xtest API. As a result it should run on pretty much any Unix/X11 computer that has a serial port. 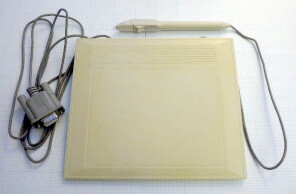 The Tabby graphics tablet was produced by a British company, Micrograf International, in the early '90s. It connected to the serial port on Atari ST series computers. Versions were produced for other platforms as well. A description of the serial protocol can be found here. An updated version, the Tabby 2, was later produced. It used a different protocol. Windows drivers for the Tabby 2 are available on the net. As far as I know there are no Unix drivers for the Tabby 2.
where PORT is the path to the serial port (e.g. "/dev/ttyS0" or "/dev/ttyUSB0"). To build the tabby binary, simply run "make". You will need gcc and X11 headers (including those for the Xtest extension). You can edit the Makefile if you need to change the compiler or header locations. You may also need to specify your X11 header location by adding, for example, "-I/usr/X11R6/include" to the compiler commandline. Although the driver works well for the tablet that I own, it may need some adjustments for optimal performance with other tablets. In the source, there are five main parameters that can be changed, three of which affect the proximity sensor and two of which affect the position sensor. If you change these values you will need to recompile the program before they take effect. PROX_BUF_SIZE The size of the ring buffer. Must be a multiple of 2 because each set of data contains 2 proximity readings. A large sized ring buffer provides greater the accuracy at a cost of reduced responsiveness. Too low a value can lead to false stylus up and stylus down events. MIN_DISTANCE Motions of less than this distance will be ignored. The distance is the length of the motion vector measured in pixels. For example, a move of 3 pixels to the right and 4 up would have a distance of 5 (32 + 42 = 52). The default value of 2.5 can handle a jitter of about 2 pixels in either direction. MAX_DISTANCE Motions of greater than this distance will be ignored. Again, the distance is the length of the motion vector measured in pixels. This parameter should be set higher than the largest motion seen in normal usage. If it is set too low then the pointer will stop tracking the stylus when it is moved quickly. The program attempts to set the serial port to raw mode but this might not be working correctly.